Update: 1:55 pm - To understand the mind set of the union leadership in stopping the right of workers to a secret vote is expressed in the following words by Jim Hoffa (president of the Teamsters union and son of the infamous former Teamster Union president Jimmy Hoffa) released today: March 10, 2009 International Brotherhood of Teamsters press release: "Since when is the secret ballot a basic tenet of democracy?" Hoffa said. "Town meetings in New England are as democratic as they come, and they don't use the secret ballot. Elections in the Soviet Union were by secret ballot, but those weren't democratic." Not everyone in America is in favor of our Constitution or our way of life. Evidence that we have reasons to be very concerned! Contact your Senators and tell them to oppose Card Check (the deceptively-titled “Employee Free Choice Act”). The Senate AGAIN considers Porkubus - the 2,900 paged H.R. 1105, 2009 omnibus appropriations bill. The $410 billion bill combines the 9 unpassed appropriations bills from last year and funds the federal government through September and adds more than $7.7 billion in pork projects as detailed in yesterdays post. A continuing resolution expires on Wednesday. If they would extend the continuing resolution through September, it would fund the government at its present level with no increases and would stop all this pork! Why shouldn't the federal government have to tighten its operations just like most taxpayers? Eight amendments are expected to be considered today. Among these are amendments from Sen. John Ensign (R-NV) to remove a provision designed to kill the D.C. school voucher program, from Sen. David Vitter (R-LA) to do away with automatic congressional pay increases, from Sen. Jeff Sessions (R-AL) to reauthorize the E-Verify program, and one from Sen. John Thune (R-SD) concerning the fairness doctrine. After all debate on amendments is completed (likely sometime this afternoon), the Senate will being a series of roll call votes. Following the amendment votes, senators will vote on cloture on the omnibus bill itself. If cloture is invoked, the Senate will vote on final passage of the bill. Yesterday, the Senate rejected an amendment by Sen. John McCain (R-AZ) to strip earmarks from the bill by a vote of 32-63.Sen. McCain somehow believed his fellow Senate democrats would be reasonable -- they rolled you again John! Also rejected were an amendment from Sen. Jon Kyl (R-AZ) to prohibit funds for reconstruction in Gaza from going to Hamas and two other GOP amendments. 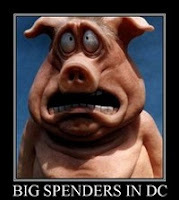 Looks like democrats are determined to have more pork and to subsidized a terrorist group. Today, George Miller (D-CA), chairman of the House Education and Labor Committee, and Sen. Tom Harkin (D-IA), chairman of the Senate Agriculture Committee, are holding a press conference to announce the introduction of the infamous card check bill (the deceptively-titled “Employee Free Choice Act”) in Congress. Card check is a bill desired by both President Obama and his Union (leaders not workers) financial backers. It strips away the right of the workers to have a secret yes or no vote on creating a union where they work. If passed, thugs working for union leadership can go to a non-unionized company or even approach workers outside of the company and intimidate them into signing a petition to unionize without later having the protection of the secret ballot on whether to unionize or not unionize. This bill is a payback to the unions by the President and members of Congress members who relied on union funds for their campaigns. Just consider the impact: an American institution - the right to a secret vote may soon be taken away by the Congress United States government. And President Obama met with the unions and said he wanted "card check" passed so the Senate Democrats previously mentioned are putting the bill forward. We already have problems with the union's self-serving interests (not the workers) destroying the American auto industry. How's that working for us? Of interest is that Bloomberg and The Wall Street Journal have both reported that several Democrats in the Senate are uncomfortable with supporting this legislation, even though they voted for it last year. Arkansas' Sen. Blanche Lincoln and Sen. Mark Pryor should be very concerned because most of their constituents do not support Card Check, i.e., the taking away a workers right to a secret ballot. Also, businesses headquartered in Arkansas will be seriously affected. Reuters has already reported this morning that the stocks for Wal-Mart Stores, Inc., headquartered in Arkansas, are being affected by announcement of the the pending Card Check bill. Citigroup downgraded Wal-Mart Stores Inc (WMT.N) to "hold" from "buy" saying the proposed card check legislation would increase laborcosts and could be a significant drag to earnings for the world's largest retailer. "We believe that WMT would be the primary target if EFCA/card check were to be passed," analyst Deborah Weinswig wrote in a note to clients." During this debate on the Democrats’ $410 billion "porkubus" spending bill, the following reports in the press reflect that a number of Democrats are uncomfortable with the agenda that their leadership and the administration are pushing. Although the train has left the station, maybe there is hope and a signal of trouble for Obama’s ambitious plans that are pushing us towards greater socialism, less individual rights, and loss of control of our money and decisions. The Wall Street Journal reports today, “Democrats’ difficulty passing what party leaders expected to be a routine spending bill could signal problems ahead enacting President Barack Obama’s agenda.” Sen. Tom Harkin (D-IA), chairman of the Senate Agriculture Committee, tells The Journal, “It’s been a lot harder than I thought it would be.” The WSJ points out, “The spending-bill fight has also exposed tensions between the House and Senate. House Speaker Nancy Pelosi (D-CA) has said that if even one Republican amendment to the spending bill passes, the entire measure would be set aside and the government would be left to operate at 2008 spending levels through the end of the current fiscal year.” What a Great result - American taxpayers would benefit by holding to the 2008 spending levels! The Washington Post picks up on the same issue, writing, “Democratic leaders in Congress did not expect much Republican support as they pressed President Obama’s ambitious legislative agenda. But the pushback they are receiving from some of their own has come as an unwelcome surprise. As the Senate inches closer to approving a $410 billion spending bill, the internal revolt has served as a warning to party leaders pursuing Obama’s far-reaching plans for health-care, energy and education reform.” It is worth reading this entire article. Tags: Blanche Lincoln, Card Check, Congressional Pork, Mark Pryor, omnibus bill, porkubus, US Congress, US Senate, Wal-Mart, Washington D.C. To share or post to your site, click on "Post Link". Please mention / link to the ARRA News Service. Thanks! Calling Card Check the “Employee Free Choice Act” is the classic practice of political thugs because the proposed Card Check system will really take away any workers freedom to choose to unionize or not. This will take America back to the days of sweat shops except it will the unions that make workers sweat. As a business owner, I would rather go to jail for refusing to allow this kind of intimidation; I would rather close my business that be intimidated by the unions.